Supplied only to trade and professional masonry painters in Birmingham, SecoFLEX is a protective exterior wall coatings which is ideal for domestic and industrial exteriors. The unique formula has been used throughout Europe since 1975 and has even been used on the Nemesis roller-coaster at Alton Towers! There is a network of SecoFLEX Approved Applicators covering Birmingham and the West Midlands area. SecoFLEX has its own unique characteristics which will be appreciated by expert masonry painters in Birmingham. It is a coloured masonry coating giving buildings a fresh appearance. There is a range of colours and you can get a preview by using our online colour picker. Being 100% waterproof it will keep the elements out but the benefit to masonry painters in Birmingham is that it is a massive 400% elastic meaning it can stretch and bridge surface cracks and fissures. Blister and flaking can be prevented making SecoFLEX a superior product in comparison to other masonry paint. 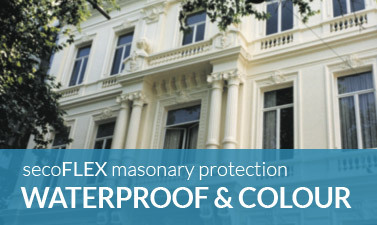 Masonry painters in Birmingham can see the specification of SecoFLEX here. Being located in an industrial heartland of the UK, you need a high performance protective coating to meet industrial demands. If you are a professional who would like to gain certification as an Approved Applicator then please contact us today. To get a free survey for your building from an Approved Applicator today, click here.